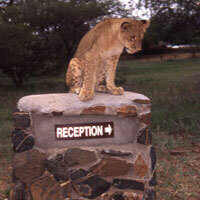 The 5000 hectare reserve near Hoedspruit is the home of the big 5. The rehabilitation program: sick, injured or orphaned animals of all shapes and sizes have been nursed back to health and re-introdused to the wild and in this process the animals formed an strong bond between man and animal. Model shoot with wild animals is possible. Children under 12 jr. half price. 3 meals, morning walk and game drive in the afternoon. Ask for specials depending on no. of days stay and pax. Pricing to change without notice.